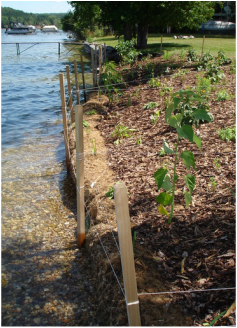 A natural shoreline uses native plants and organic material to create a stable boundary between land and water that protects your property from waves and erosion, while improving the ecological relationship between lake and lawn. Natural shorelines provide multiple benefits to our inland lakes. Natural shoreline landscaping and bio-engineered erosion control techniques can restore those benefits by reducing runoff, deterring geese, stabilizing soils and improving fish and wildlife habitat while maintaining aesthetically pleasing access to your lake. Already have rock or sea wall? Learn how to enhance those structures for the benefit of your lake. Professional landscape designer and owner of Designs in Bloom in Frankfort, Carolyn has participated in the conception and installation of multiple shoreline projects. She presented on the design aesthetics of natural shorelines and the necessary steps for creating a natural lakescape on your property. Elizabeth presented on the basic ecology of shoreline restoration, the benefits of installing a natural shoreline, and the repercussions of hazardous shoreline practices. A representative of the Invasive Species Network, Emily presented on the threat of invasive and how to identify and remove them from your property. Conservation Specialist for the Benzie Conservation District, John facilitated the event. Barry is the Benzie County representative for the MDEQ. He lead a Q & A session on the rules and regulations for obtaining the proper permits to begin a shoreline restoration project. Ed presented on the Shoreland Steward Program which he helped to develop with the Michigan Natural Shoreline Partnership.